ARCS Foundation Honolulu was the seventh chapter chartered when it incorporated on Dec. 27, 1974. It remains the foundation’s fourth-oldest chapter. 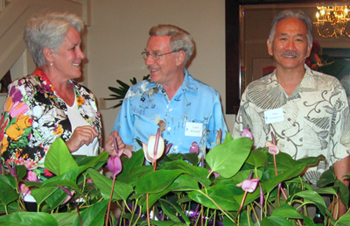 Honolulu celebrated ARCS Foundation, Inc.'s 50th anniversary with a luncheon at College Hill, home of the University of Hawai‘i president, in 2008. Cynthia Hunter, a Honolulu board member and ARCS Scholar alumna visited with UH respresentatives Laurence Kolonel, a cancer epidemiologist and 2005 ARC Honolulu Scientist of the Year, and Alan Teramura, dean of the College of Natural Sciences.